The recent announcement that the "Britain, Merchant Seamen, 1918-1941" record collection is available on Findmypast was welcomed by a number of people including myself. In a number of cases, they extend the "British Merchant Navy, First World War Medal Cards 1914-1925" and "England & Wales Merchant Navy Crew Lists 1861-1913" record collections that Findmypast already hold. As well as the usual name, date and place of birth, there are additional identifying features like the discharge number and the identity certificate number which can assist in finding further records about your person of interest. The real gold is the physical descriptions of the individuals, along with a photograph for some - and the names of the ships that they served on! 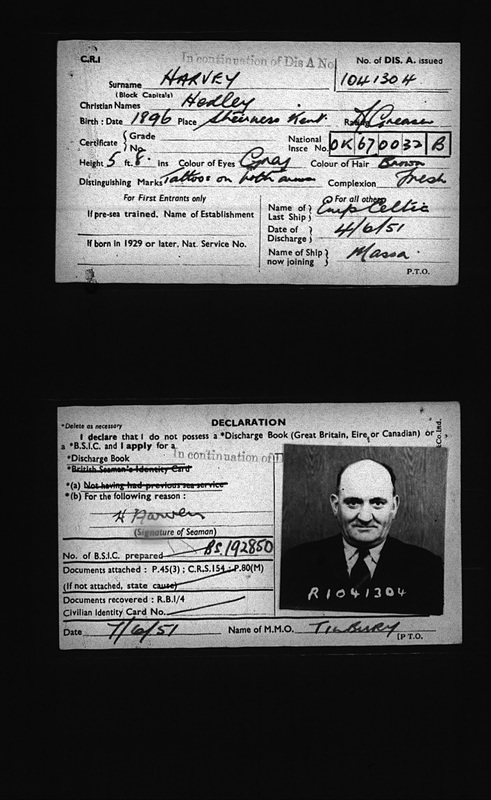 This card (front and back) is a "CR1" from The National Archive series BT364 gives the discharge number 1041304 and the registration number 460898. 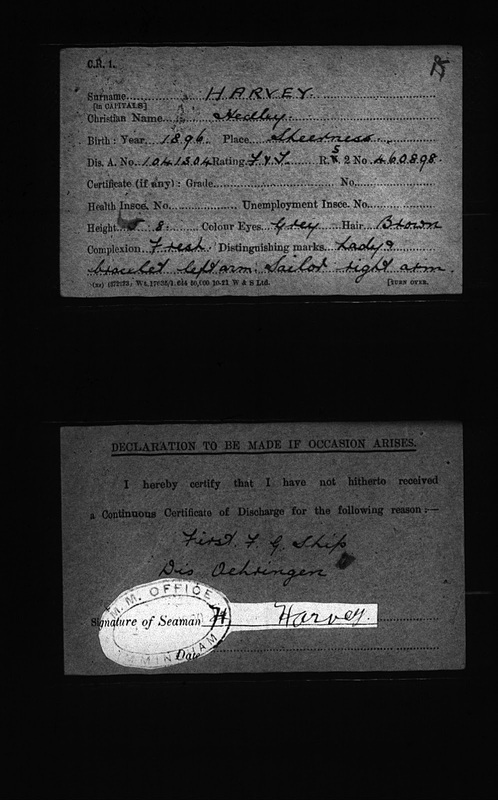 The discharge number followed the seaman from ship to ship when his contract ended. The rating F & T refers to his trade - "fireman and trimmer." Note that the birth place cannot be relied on as accurate as Hedley was actually born in Newfoundland not Sheerness. The distinguishing marks provide a nice description of his tattoos. 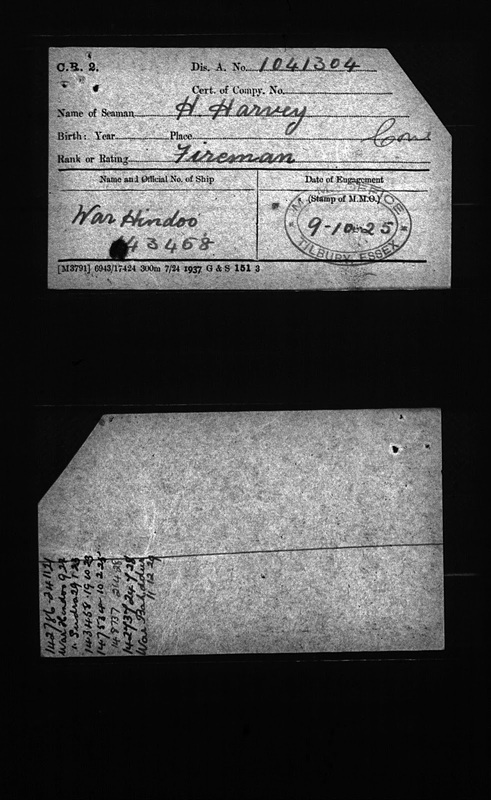 On the reverse of the card it states "First F.G. Ship" meaning first foreign-going ship, and discharged "Ochringen" - a port in Holland. The highlighted bit is annoying, and was already on the image, but behind the word Seaman on the stamp, I can almost make out a year - which I think is 1920. This card is a "CR2" from series BT364. 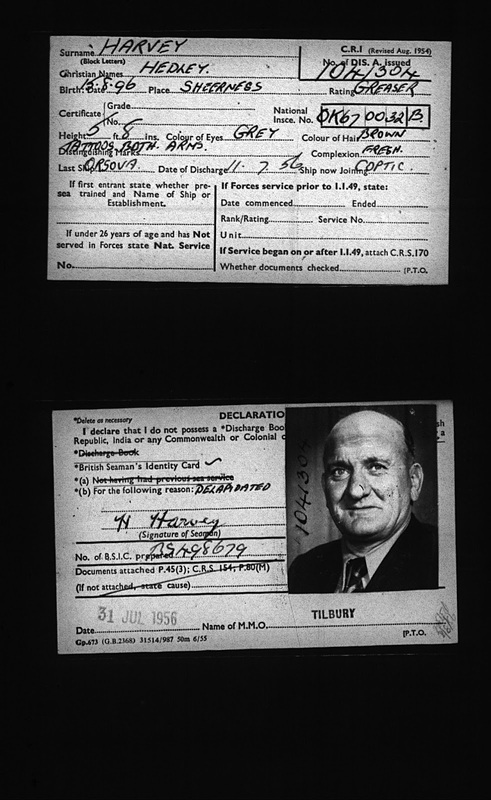 It lists the seaman as only "H. Harvey" but because I knew his discharge number I was able to verify that this was the same person. 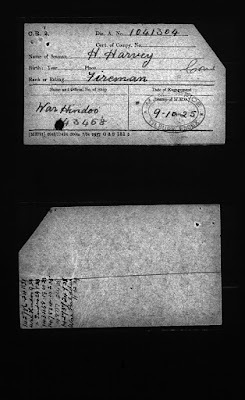 The card gives details of his service.He is being engaged on the War Hindoo in 1925, but if you see the reverse of the card if gives a series of numbers, names and dates that detail the rest of his service up till 1929. The "War" ships are part of the Royal Fleet Auxiliary that existed to support the Navy. The Historical Royal Fleet Auxiliary has a useful website where you can get the history of the ship including its movements in the date range that the seaman served. The Crew List Index has a helpful way of searching by either number or name of ship. Hedley's national insurance number is included on this card - another useful piece of information, that can assist in searching for more information about him later. In 1951, it notes his last ship is Empire Celtic, a landing/troop ship for the Royal Navy post-1945, and his next ship is recorded as Massa - although so far I've not been able to find a ship of that name. He is engaged as a "greaser", which meant he worked under an engineer and was responsible for lubricating, cleaning and repairing machinery. His earlier designations of fireman, trimmer and stoker, all related to feeding the engines with fuel. He appears to have lost his discharge book and is applying for a replacement. This next card sees Hedley being discharged from the P&O ship Orsova in 1956 and joining the Coptic, which belonged to the Shaw, Savill and Albion line. Merchant seaman's belongings must of been notoriously difficult to keep, as on this card he is applying for a new "British Seaman's Identity Card" as his old one is delapidated. These are by no means all the ships that Hedley served on. He had originally enlisted in the Royal Navy in 1915, and was in the Royal Navy Reserve and called up again in 1939.He was at sea most of his adult life until retirement. Using Ancestry, I can track his further movements around the world, using passenger and crew lists. Hopefully, some more seaman's cards will surface, which will give me further information.